Siriki Dembele after signing for Posh. Latest signing Siriki Dembele wants to get the Peterborough United fans on their feet with excitement. The fleet-footed wide player moved to Posh from League Two side Grimsby Town on Friday (June 24). The 21 year-old signed a three-year contract after the club’s agreed an undisclosed six-figure transfer fee. Dembele was born in the Ivory Coast, but was attached to the renowned Nike Academy when Grimsby scouts spotted the his potential. He played 39 times for Grimsby in his debut season as a professional, scoring four goals. “This is an exciting move for me,” Dembele enthused. “I came to Peterborough because they play the sort of fast, open, attacking football that I enjoy. “I hope to get the fans on their feet. I hope I can show them how quick I am and how well I can dribble. “I hope to score goals and assist on goals. That’s my aim for this season. “I enjoyed my first season as a professional at Grimsby. I played well in the first half of the season and I tried my hardest in the second half. “I am grateful to them for giving me an opportunity. The Nike Academy was good for me as that’s where Grimsby saw me play. 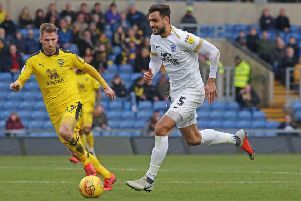 Posh boss Steve Evans spotted Dembele’s potential after the winger played well against his Mansfield last season. Posh beat off opposition from a host of League One clubs to get their man. He’s the ninth signing of the summer made by Posh.